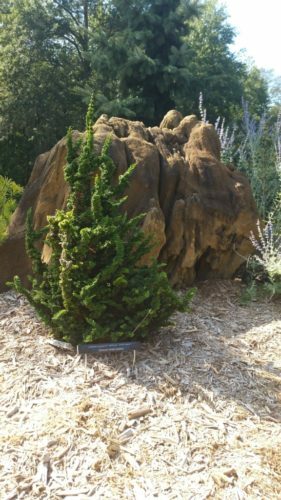 Chamaecyparis obtusa 'Chirimen' is a dwarf form of Hinoki cypress named for the wrinkly silk crepe fabric used to make Japanese kimonos. This cultivar sends up interesting clusters of upright, irregular shoots in myriad shapes and colors, primarily a rich green but, depending on conditions, they can have grey or bluish tones. Plants tend to retain clumps of seed cones along the branches that may resemble a deformity or disease, but this is a natural occurrence; they slough off over time and are obscured by new growth. Its congested foliage and unusual appearance makes 'Chirimen' a perfect candidate for a focal point in a small garden. It performs best planted in full sun but will tolerate some shade. Good soil drainage is a must. Typical rate of growth in most areas is up to 4 inches (10 cm) per year resulting in a naturally sculpted, irregular, upright shrubby tree, 1.5 feet (45 cm) tall and 1 foot (15 cm) wide after 10 years in the garden. Some authorities feel that, after many years in the ground, it can take on a more expansive growth rate, exceeding the definition of true dwarf. This cultivar is sometimes seen listed in the nursery trade as 'Chairman' or 'The Chairman,' which are clearly misspellings. There is interesting speculation as to the origin of this cultivar. Oakdene nursery of Sussex, United Kingdom claims credit with this cultivar's origin and introduction in the early 1990s. While at the same time David Sampson of Cedar Lodge nursery, Australia makes the same claim. Given that the cultivar very likely originated in Japan, it can be speculated that both nurseries received propagation material at the same time. Stanley and Sons nursery, Boring, Oregon made the U.S. introduction in the early 2000s. 'Chirimen' was one of two plants selected in 2011 for the ACS Collectors Conifer of the Year program. 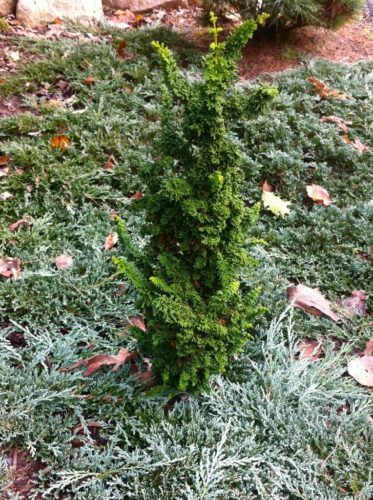 Chamaecyparis obtusa 'Chirimen' dwarf Hinoki cypress photographed in Brunswick, ME, fall 2013, with a ground cover of Japanese garden juniper. Chamaecyparis obtusa 'Chiriman' at Blue Horizon Nursery in Grand Junction, Michigan.